PayPal App: Not just for bills, but for donations too. Earlier this week PayPal added a donation feature to their iphone app. It lets people donate to more than 23,000 charities in the U.K, U.S. and Canada. Their aim is to simplify the donation process to allow charities to reach more donors. Will it open the doors to a new segment of donors? Or are people either givers or not, regardless of how easy it might be for them to open their digital wallet? An interesting one to keep an eye on. Good work PayPal. Emergency Response 2.0 – Tweet it & they will come. From large scale natural disasters such as Haiti, to neighbourhood the-girls-are-stuck-in-the-drain scares, social media is changing the way we communicate in times of emergencies. We all know twitter is a real time source of communication – exactly what is needed in an emergency response when every second counts. Social media not only facilitates a mass communication outlet for a victim of an emergency but also allows individuals to become part of the emergency response itself. In a recent study conducted by American Red Cross the majority of online users said they would use social media to seek help for themselves or others during an emergency. And then almost 3 out of 4 people said that they would expect help to come less than an hour after they posted their call for help on twitter or facebook. Governments and aid organizations are attempting to step up and put resources behind strategies to monitor this valuable online chatter. But whether they currently have the means to effectively use the information coming in is up for debate. Organisations are pushing us back to traditional forms of communication when an emergency strikes, and encouraging the public to use the emergency phone lines for the first point of call over relying on twitter or facebook to instigate a response. There is no doubt that social media is an invaluable resource for local emergency teams, governments and international aid organisations. And the more reliant that we as the public become on the inter-web for day -to-day comms, the heavier the reliance will be on it during a time of emergency. But how the public and the experts can work together to leverage the benefits of this live feed of situation updates is the question. Would you expect some-one to respond if you posted a call for help on twitter? Who would you give $10 to? Acts of generosity are contagious. Giving breeds giving. 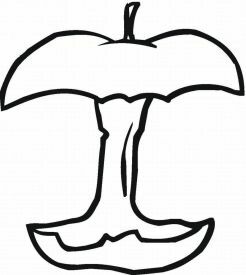 Water the tree and it will give you perfect apples… or was it a plant and flowers. You get the idea. One man is putting our child hood dreams in humanity to the test. A Year of Giving. One man. Giving $10 to a different person every day for a year. Simple. He is writing about each person he gives to over on his blog. He is not trying to change lives with $10. Only to inspire the act of giving. You can’t argue with that. I have been following his blog. He is now up to day 219. Great place to go for some inspirational reading and to re-light your there-are-good-people-out-there fuse. On the other end of the scale. Someone ran into my car while it was parked outside my house the other day. No-one left a note. Today I met Priyani. 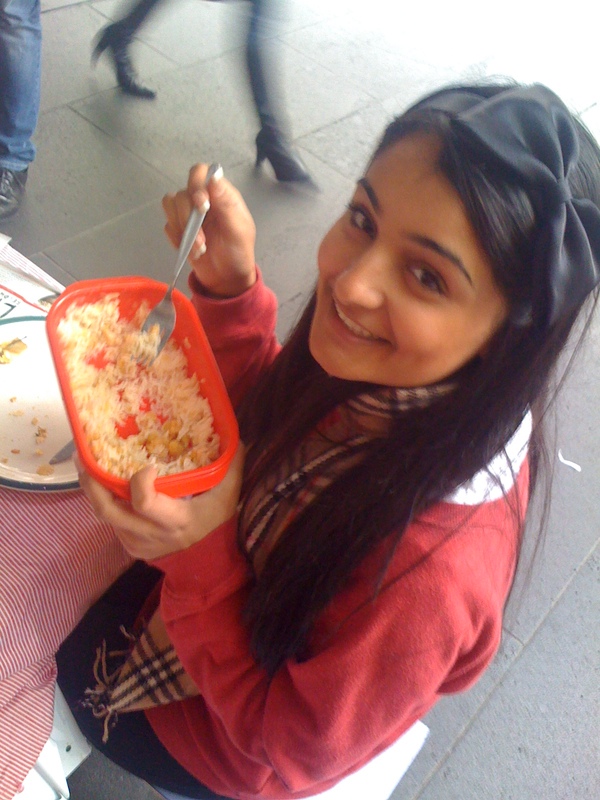 A young girl living off $2 a day in Melbourne. 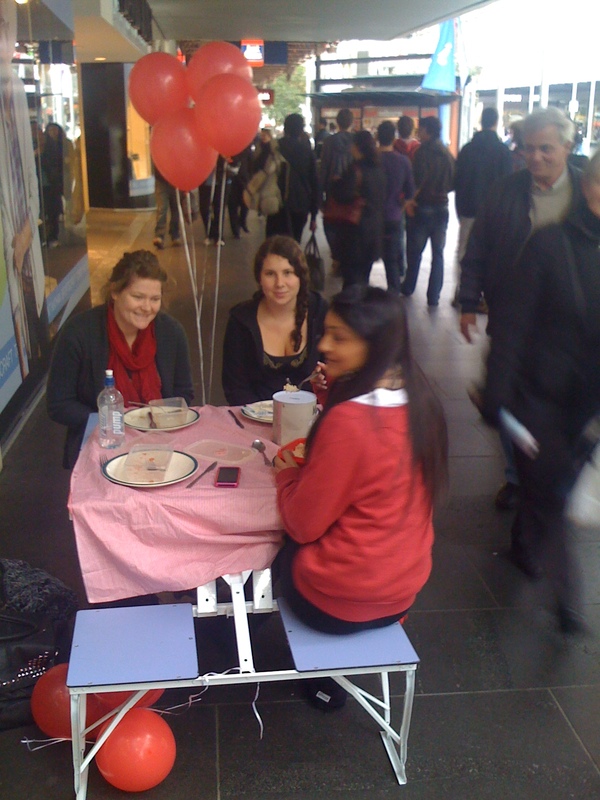 She’s sitting at fold-up camper table in the middle of Bourke St Mall. It’s 1pm, lunch rush-hour in the CBD. The pretty Indian-looking girl is sitting in between two giggling friends, eating rice from a tupperware container. Shyly, they offer me a small bag of rice. This will be the 27th day Priyani has had rice for lunch. And she’ll have another bowl for dinner tonight. She’s not homeless or broke. In fact, Priyani works 40 hours a week in a restaurant. The rice (and oats for breakfast) diet is part of a campaign to help raise awareness in Australia of extreme poverty. Around 1500 Australians are joining her this week for the official Live Below The Line campaign, which runs from 2-6th August. So what’s it like to live for $2 a day in Melbourne? She tells me she constantly feels tired, and her memory has gone. Such are the symptoms of malnutrition. For the full experience, check out her open diary. She’s aiming to raise $500 toward education programs. Live Below The Line is a good example of making the most your ‘flag-wavers’, those like Priyani who are active participants in your cause. By helping them to be as connected as possible – to their online friends and to other participants – you start to build a strong web of support. Traditionally, online sponsorship models like Everyday Heroes only allow individuals to interact with their supporters. All the content on the livebelowtheline.com is share-friendly; from venting about your hunger on a hosted-blog, discussing the drama with fellow faminers on the forum, to sharing out to other social media platforms like Facebook and Twitter. It’s easy and integrated. There’s a genuine community here, heavily populated by Gen Y’s. It’s like a pimped-out 40-hour famine mashed up with the 2.0 picnic-challenge. Lesson for short-term awareness campaigns: set up a challenge that’s both relatively achievable and relevant, and provide your participants with the right tools to share their common experience.